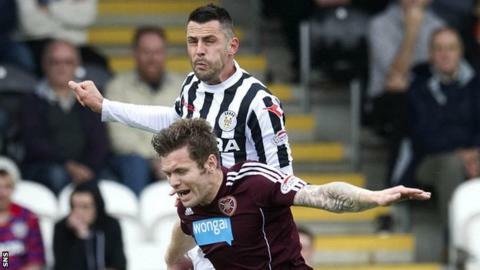 St Mirren manager Danny Lennon hailed striker Steven Thompson's nous after his side's victory over Hearts. The Buddies consigned the Scottish Cup winners to a second successive league defeat with a 2-0 win in Paisley. And Lennon highlighted the intelligent play of Thompson, who set up his side's second goal, as key to the win. "I thought he was exceptional from start to finish, it was a real, real team performance form Stevie," Lennon told BBC Radio Scotland. Thompson unselfishly laid on a chance for Lewis Guy, who tapped the ball home to seal the Paisley side's victory. "Last season, for me, that was the type of one that Stevie would have went and hit himself," admitted Lennon. "But, with Lewis Guy so quick there to get quick support in, Stevie had that option and makes intelligent decisions and made the right one for the team." Jim Goodwin's 40-yard opening goal also drew praise from his manager. "He scored a terrific goal like that last season against St Johnstone," said Lennon. "It came at a good time for us, if you look at the stats, Hearts could have been two up. "They're a big team and they play for the set pieces but I thought we handled that and I thought we looked a constant threat on the break." Lennon was also delighted with the debut of left-back Paul Dummett who has joined from Newcastle on loan. "I thought it was an absolutely fantastic debut for the young boy," said Lennon. "Nothing seemed to faze him. "They asked questions with [Andy] Driver and [Arvydas] Novikovas and then Callum Paterson had a go at him and I reckon he handled that pretty well." However, Lennon does not want his players to get carried away with the victory. "We made a decision as a team today that it was a test," he added. "We've never beaten Hearts since I've been here, and it was a test to see if we could move on to that next level and get the three points. "And I'm delighted we passed that test. "Unfortunately, we've got 31 more tests to come. That's the challenge for us, to see if we can continually turn and grind these results out."